The 9th generation of iPhones are now here. On the other hand, the prime competitor Google comes with the first Google-made Android device as well. With the Google Pixel and Google Pixel XL, the Nexus line fades away and Google now settles down with their own software and hardware. There’s nothing much to be said about Apple though, the iPhones are always great at handling daily tasks and with the latest A10 Fusion chip, there’s no reason that the iPhone 7 Plus will ever face any stutter or lag. Since Google came up with the cleanest and purest Android experience ever this year, we finally got a chance to put these two phones against each other. If you want to see such a comparison in video format, then YouTube would be the best place to look for. With both phones now rolling into the market, the YouTubers have already done a lot of comparison reviews with these two devices. However if you prefer going through a write-up platform to learn the details better, we got you covered. So there’s two tests to be done, one where only the system apps would be launched in both smartphones. On the other test, third party yet resource hungry apps will be launched. Once all the apps are launched on both smartphones, the task will then be re-run to find out whether the apps are still kept in the RAM, or they are loading up from scratch again. To do this test, the system apps like phone, contacts, default internet browser, calculator, calendar, camera etc. are all opened at the fastest possible pace. One app is closed and the immediate next one is opened only when the previous one finishes loading completely. In this test, the Google Pixel XL seems to have done better. The iPhone 7 Plus wasn’t far behind either, the difference appeared to be noticeable because iOS has a prolonged app opening and closing animation whereas the Android system kind of opens and closes an app within a blink due to a shorter animation. 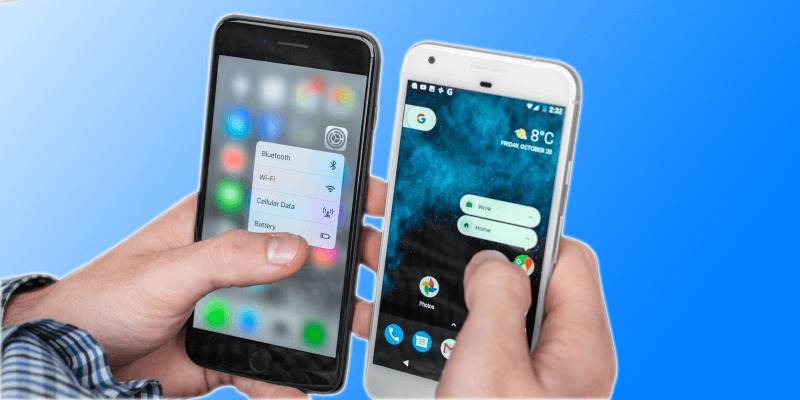 The stock apps in Android and iOS are both optimized well, so up to this point there hadn’t been any remarkable differences between the Google Pixel XL and the iPhone 7 Plus. However, third party resource hungry apps started making a difference. When third party apps downloaded from the respective app stores were opened on both iPhone 7 and Google Pixel XL, it appeared that iPhone 7 Plus has these apps better optimized. Adobe Photoshop Fix, Photoshop Lightroom or Premiere loaded within a blink, whereas the Google Pixel XL has taken a remarkably longer time. Also, the processing and rendering of phtos had taken longer in the Pixel XL. Not much, but noticeable. This happened because apps in Android take longer for optimization and Android 7.0 Nougat is brand new to have that optimization just yet. iPhone 7 Plus wins this 2nd battle with its iOS 10. Conclusion: So if you are planning to get one of these phones for their performances, assess your requirements first. If you plan on making professional quality videos shot with your phone on the go then iPhone 7 Plus should be the definite choice. For anything else, the Google Pixel XL is just fine.